We’re time-tripping again this year, back to the 1970s. Get out those bellbottoms and disco shoes. We’ll be dancing to some great rock-and-roll, eating some excellent food from local vendors, and drinking some great craft beer, wine, and cocktails. There will be a costume and dance contest and, of course, there will be a silent and live auction of incredible stuff you are going to want to bid on. It’s a great time and it all helps support the mission of the museum. Tickets are still available if you need them. Grab them here! Everyone is encouraged to dress up! Mingle with other Raleighites, including our wonderful museum staffers, 1970s style. Plenty of beer and wine to drink including a signature cocktail. Hors d’oeuvres and plates from some of our favorite restaurants. Art Auction – a curated selection of local art that you can take home. Silent Auction – A wonderful selection of items from area businesses and restaurants for your bidding pleasure. 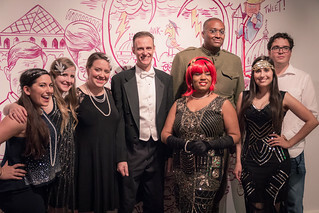 Check out a sample of past Time Warp’s on our Flickr page including 2017’s 1920s-themed event! The Friends of the COR Musem could not put on Time Warp without the help of our community. If you have participated in years past, Thank You for your support and we hope you’ll join us again this year. For newcomers, we hope you can consider joining our growing community and we’ll do our best to find an appropriate way to showcase you or your business as a supporter of the City of Raleigh Museum. Our sponsorship packet can tell you more about these opportunities but please feel free to contact us if for any special arrangements. At 8:30 pm, we will be holding our dance contest, 1970s-style! For only $10, you have the opportunity to impress our celebrity judges and possibly win a great prize! 2018 Dance Contest Prize: One-night stay in a downtown Raleigh hotel + the Aphrodisiac Experience including food and drink to multiple downtown restaurants and bars. Everyone can enter! It’s free, just start dancing. From 7-8pm, we’ll be picking nominees for each category with the judges deciding our winners after the Dance Contest.